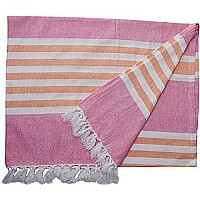 This super stylish and colorful towel is perfect for bath, beach, or pool. Extra large, highly absorbent, fast drying, and versatile, this Turkish towel is passion pink and apricot striped. It measures 60? x 40? and is absorbent and fast drying.